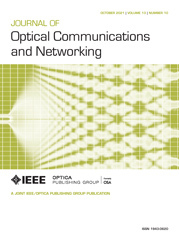 In this paper, a code division multiple access (CDMA) enabled dynamic bandwidth allocation (CDBA) algorithm is proposed for the upstream access scheme for Ethernet passive optical networks. The CDBA algorithm is based on two major components. The first is the parallel transmission capacity offered by CDMA according to the quality-of-service requirement, and the second is the scheduling algorithm, which uses the round robin technique. The CDBA algorithm is presented and its cycle time is derived. The performance of the proposed algorithm is studied, assuming that the traffic load is symmetric and that the packet arrivals are Poisson distributed. Extensive simulations have been performed in order to compare the proposed CDBA algorithm with existing dynamic bandwidth allocation algorithms that achieve good bandwidth utilization by use of polling schemes. It is shown that the CDBA algorithm can significantly improve the network performance in terms of packet delay, throughput, and queue size management as compared with the well-known interleaved polling with adaptive cycle time algorithm.